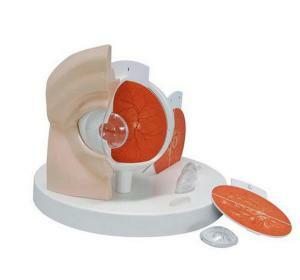 This model shows an eye enlarged by a factor of five and can be used for patient education. The easy-to-use, switchable, and didactically simplified representations of the retina and lens make it easy to explain to the patient the typical changes that occur in a healthy eye due to common diseases. The base includes additional views of valves.